The small Indonesian island province of Bali is one of the nation’s top tourist spots, celebrated for its temples, artistic communities, and incredible landscapes. Discover the best art and culture tours Bali has to offer. Known as the land of a thousand temples, Bali is home to more than 5,000 stunning examples. This makes it difficult to know where to begin. Tanah Lot temple is one of the most famous, known primarily for its unusual position atop a rock formation at the edge of the sea. Bali Agung Tours bring travelers to the temple at sunset, taking advantage of the warm glow produced by the last rays of daylight. Although the temple is visited at the end of the day, tours begin at 8:30 am. It takes visitors to other locations including the Suwung, Celuk, Kemenuh and Kayuamba villages as well as the spectacular waterfall at Tegenungan. The Bintang Downhill Cycling Tour is not a typical bicycle adventure. It uses the bike as a peaceful and exhilarating way to journey around the Northeastern area of Kintamani. Groups are led through the region’s lush, green landscape to visit ancient Hindu temples and local craftspeople on the way to the charming and authentic village of Pejeng. To begin the tour guests are brought from their hotels to enjoy a morning coffee while soaking in the majestic sights at Lake Batur. Later in the day a traditional Indonesian lunch, prepared in the open kitchen of a Balinese family, is enjoyed in a pleasant garden setting. The price of the tour includes a mountain bike, helmet, water, coffee, a soft drink, and lunch as well as transport to and from the hotel. Bali Food Safari takes visitors on a tour of some of the island’s most outstanding restaurants. The selected establishments are remarkable not only for the quality of their food but also for the particular atmosphere that they create for the dinner. Guests have the opportunity to sample between nine and 12 courses at the three or four restaurants visited over the course of the tour (depending on the tour package). Special customized tours can be created for groups of six people or more to suit the specific tastes of the participants. Transportation from the hotel and between the various stops along the route is included in the booking. For those with an interest in Bali’s traditional arts and crafts scene, Ubud Art Village Tour visits the art villages in and around the artistic center of Ubud. Sites of interest include Celuk Village, famous for its highly skilled gold and silver crafting and Mas Village, renowned for its master carvers of teak, mahogany, ebony and hibiscus wood. There’s also Ubud Market, open daily for the exchange of arts, handicrafts and textiles. Also featured on the itinerary are the Sacred Monkey Forest and the Ubud Palace, the residence of Bali’s Royal family. As one of the world’s most awe-inspiring destinations, Bali attracts many travelers wishing to capture the vibrant landscape of this multicultural island on film. Balifornian Photography, together with Floating Leaf Eco-Retreat, offer what are perhaps the region’s most well instructed and professionally organized photography tours. Experienced guides lead visitors to places of stunning natural beauty and ancient cultural significance. Each of the destinations on the tour has been chosen for the variety of photographic challenges and opportunities that it presents. Visits are organized for the appropriate times of day in order to take advantage of the sun’s position in the sky. Travelers benefit from the instruction of highly experienced guides and leave Bali with the perfect documentation of their trip. Bali’s range of traditional dances combine elements of religious and artistic influence, culminating in highly expressive, decorative and dynamic performances. One has not fully experienced Indonesian culture without bearing witness to these spectacles. Over the course of four hours, the Bali Traditional Dances Tour exposes travelers to three of the dozens of different types of colorful Balinese dances. Typically performed as an exorcism to promote health within the village, the Sanghyang (Trance) Dance is followed by the Kecak (Monkey) Dance. In this dance, a large group of men performs while carrying bamboo torches. Then there’s the Fire Dance which is enacted atop scorching hot coals. To provide visitors with access to the real Bali, Bali Bagus Tours offers unparalleled access to the everyday experience of the people who live here. This eight-hour tour begins bright and early with a trip to the daily morning market, where local housewives shop for food, spices and other necessities. Next, a guide leads groups through the nearby village and rice fields, offering insight into the local Balinese culture. Finally, guests are invited into a family home, where they have the opportunity to engage with people from the region. Here they learn about the strong value the Balinese place on family and community. Sandy Infield began Art Hideaways upon realizing that Bali was an ideal source of artistic inspiration. She became fascinated by the attitude of the Balinese people, who believe that everyone has a creative contribution to make and that producing art is a way of demonstrating devotion to one’s family and the community. Sandy’s two-week long tours bring travelers to spectacular vistas, quaint villages, and beautiful temples. Itineraries balance studio time and cultural excursions. Individuals are able to choose between acrylic, oil, pastel or watercolor painting, drawing, batik and mono-type. Tours cater to anyone from the experienced artist to the beginner. 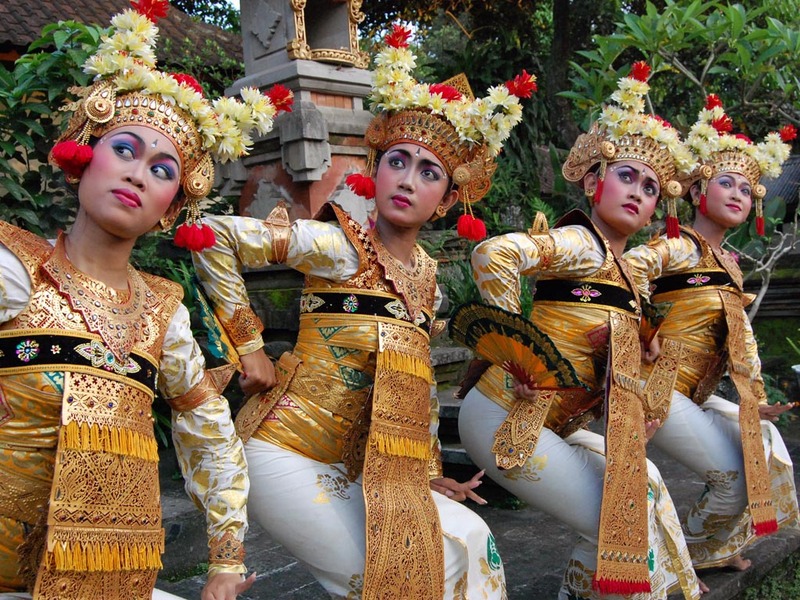 Bali Tours DB brings travelers on a three-day, two-night tour of Bali’s incredible art and culture. On the second day, following the previous evening’s dinner at a seaside restaurant on Jimbaran Beach, visitors are brought to the Village Centre of Balinese Art in Ubud. Here they are invited to learn classic Balinese dance. Afterward groups are instructed in the method of fabric painting known as batik. On the third day of the tour, travelers are taken to participate in a number of other activities around the central foothills of the Gianyar regency. Guests can choose from a range of nearby attractive hotels, the price of which, along with that of basic meals, is included in the booking.